For OV certificates, CAs must validate the company name, domain name and other information through the use of public databases. CAs may also use additional methods to insure the information inserted into the certificate is accurate. The issued certificate will contain the company name and the domain name for which the certificate was issued. Because of these additional checks, this is the minimum certificate recommended for ecommerce transactions as it provides the consumer with additional information about the business. EV Certificates are only issued once an entity passes a strict authentication procedure. These checks are much more stringent than OV certificates. The objectives are twofold: First, identify the legal entity that controls a website: Provide a reasonable assurance to the user of an Internet browser that the website the user is accessing is controlled by a specific legal entity identified in the EV Certificate by name, address of place of business, jurisdiction of incorporation or registration and registration number or other disambiguating information. Second, enable encrypted communications with a website: Facilitate the exchange of encryption keys in order to enable the encrypted communication of information over the Internet between the user of an Internet browser and a website (same as OV and DV). 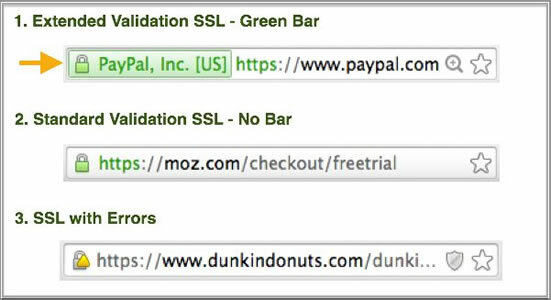 Make it more difficult to mount phishing and other online identity fraud attacks using Certificates. Assist companies that may be the target of phishing attacks or online identity fraud by providing them with a tool to better identify themselves to users. Because of the strict vetting procedures that CAs use to check the information about the applicant, the issuance of EV certificates usually takes longer than other types of certificates. .
A Wildcard SSL Certificate enables SSL encryption on unlimited subdomains using a single certificate. The subdomains must have the same second level domain name (i.e. domain.com). Multi domain certificates make it possible to secure up to 210 domains with a single certificate. You can mix all your different second level domains (i.e. domain.com, www.domain.com, domain.net, and otherdomain.com).